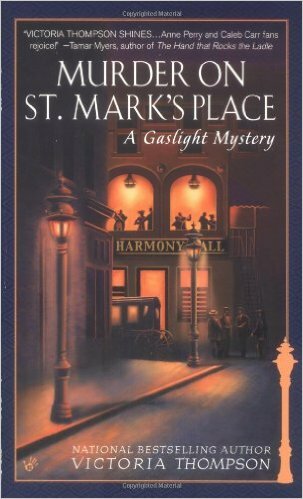 For people who are crime story lovers, I highly recommend the Gaslight Mystery Series written by Victoria Thompson, the national bestselling author of murder on St. Mark’s place. The series includes ten small books which are about ten separately mystery scenes. Right now, I am holding only three versions of the Gaslight Mystery Series — number 1, 4 and 8 — which I bought from the Used Book sale event occurred in OCCC campus few months ago. Honestly, I’m not a huge fan of detective or crime novels. The only reason which lead me purchasing those books was the acceptable price. Most of the books sold at the event cost only one dollar per one. Therefore, I thought if the stories were not good, I could have them for my book collection or a gift for my friend who might love them. However, after starting reading one book, I did not want to put it down. Personally, the way the author arranges details, evidences, characters and situation in order to create a murder is so brilliant. I believe that many audiences might fall into same situations like me, that are wrong guesses. For few first proves releasing from a scene, the author actually made me think that it is so easy to figure out the murderer. Then, she keep building more new evidences to prove that my former guesses are totally wrong. That makes me feel confused and eagerly want to continue reading in order to find out who is the real killer in the case. Honestly, detective novels never interest me because of its complicated terms that are usually used to describe in a murder or a case. Nevertheless, Victoria only uses normal and easy-to-understand words in her books, but still make her books appealing and entertaining. In addition, ten stories in the Gaslight Mystery Series are short stories. It takes me only four days to finish each book. I have to say the series are worth spending time on reading.